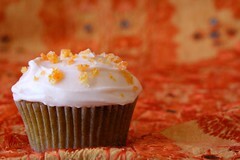 These cupcakes ended up quite delicious – very moist cake with a touch of spice, creamy frosting, and candied orange peel that provides a nice burst of orange flavor and a chewy, crunchy texture. The egg is yummy on it’s own. 1. Toast pecans in a 350 degree oven for 5 minutes. 2. Remove from the oven, let them cool, then chop coarsely. 3. Peel oranges and puree in a blender or food processor. Measure out 1/2 cup of the liquidy pulp. 4. Peel, rinse, then grate carrots coarsely. 5. 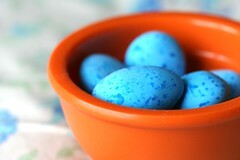 In a large bowl, combine orange pulp, carrots, eggs, buttermilk, vanilla, sugar, and vegetable oil. 6. In another bowl, whisk together flour, baking powder, baking soda, salt, and cinnamon. 7. Fold flour mixture into the carrot mixture. 9. 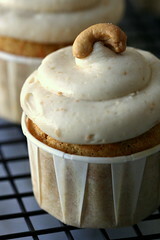 Scoop out into cupcake papers. 10. Bake at 350 degree oven for ~20 minutes or until toothpick comes out clean. 4. Add half of the sugar and the orange juice. Beat until combined. Why reinvent the wheel? 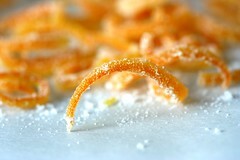 Nic over at the Baking Sheet has already gone and posted a recipe for candied orange peel. I researched a handful of methods and I liked the sound of this one over the others. I cut the recipe in half. 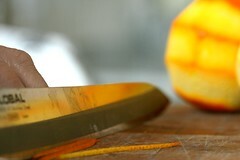 The only other change I made was to cut peel of the orange with a vegetable peeler then cut it into strips before soaking over night. Other then that change, I basically followed the recipe in her post. 1. Pipe some frosting onto the cooled cupcakes. 2. 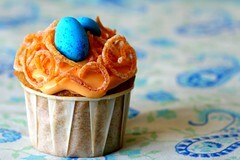 Top off each frosted cupcake with some candied orange strips and a caramel egg. 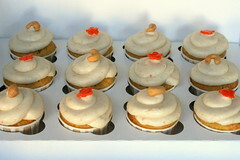 I love ginger-carrot cupcakes and made some changes to the recipe since I last made them. I added the candied ginger for the first time, doubled the ginger, and doubled the cinnamon. I wanted something with a bit more bite. I am pleased with the way they came out. I can really taste the ginger compared to the last version, but its not over powering or anything. 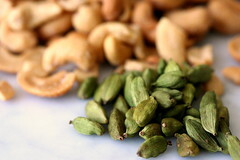 I am interested to see what tasters have to say. 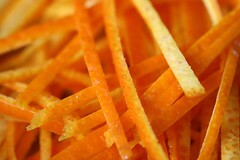 3. add carrot curls, reduce the heat, cook curls for about 10 minutes.